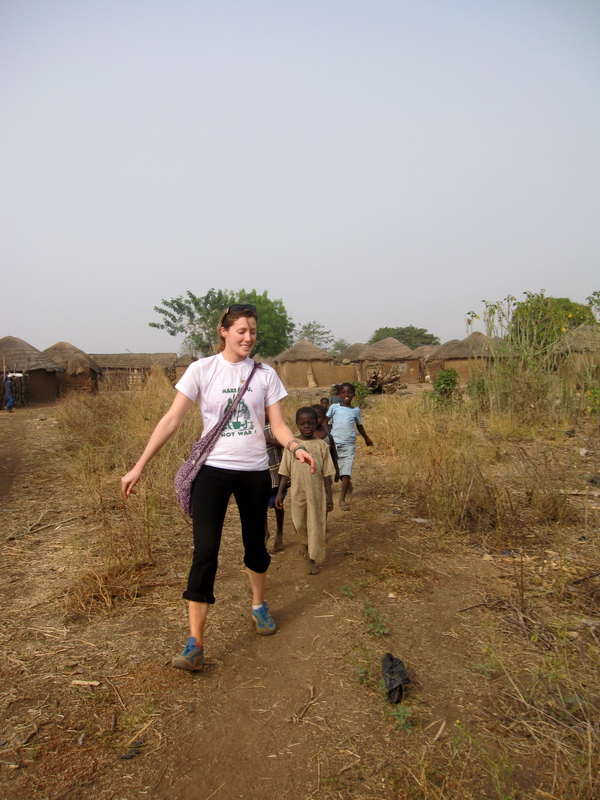 At the CWS Ghana office in Tamale, the field staff and I talk about “problem villages”. These are CWS partnership communities that need help troubleshooting issues at their water businesses. 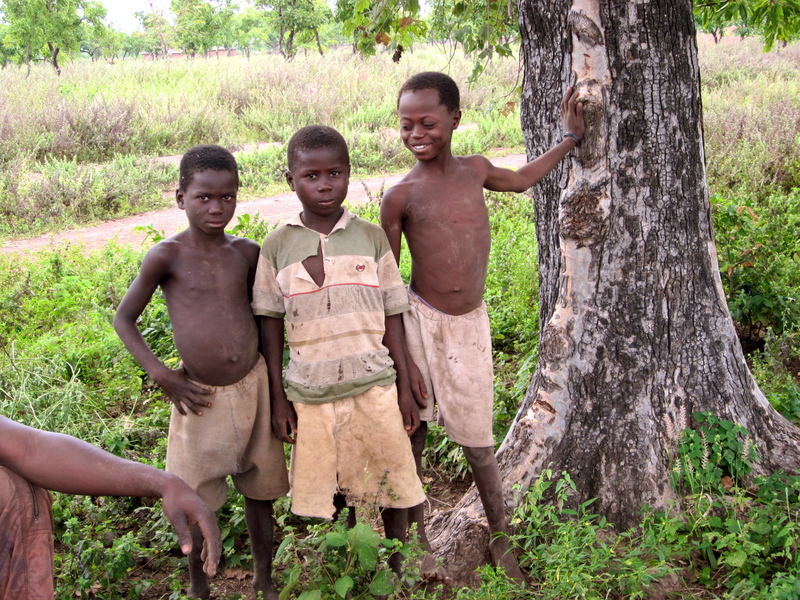 The issues range in severity as the problems could be anything from the entrepreneurs having low sales because community members are busy on their farms to something as far fetched as a community believing there is a baby who comes out at night and puts evil spirits in to the polytank (this actually happened in the village of Tunga). Let’s rewind to exactly 1 year ago and take a look at the project summaries for the communities Gbung, Jerigu and Galinzegu. This time last year the staff deemed these communities to be “problem villages”. January 4, 2013 – Jerigu. The polytank was empty. Al Hassan’s wife said her husband is busy which is why he hasn’t been treating water. He also ran out of Aquatabs (chlorine tabelts) and did not buy more until a few weeks too late. Beginning of February 2013, community members in Jerigu complain they never know when the center has water because Al Hassan is not around. 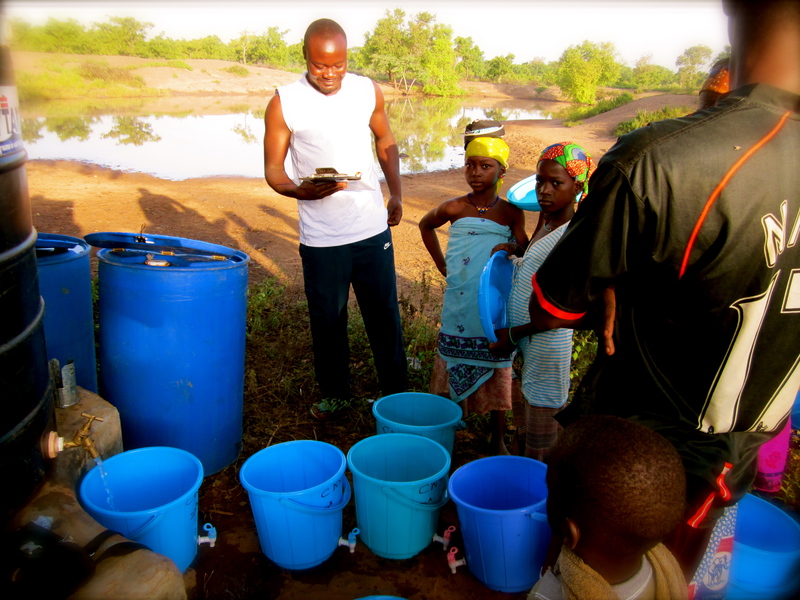 January 8, 2013 – Gbung – Wahab went to Gbung and saw the water business was empty. He went and spoke to Fati and Amina who reported they are trying to move the polytank from the market back to the dugout. 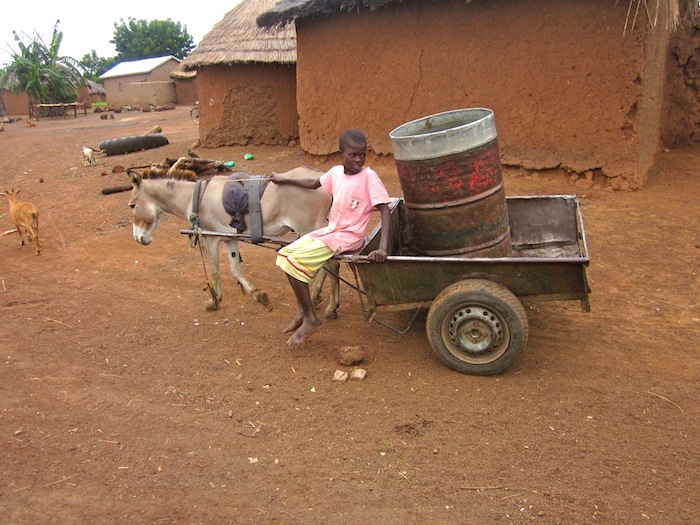 Later in January, Amina said they are paying donkeys to come fill the blue drums in the market with water for 3 GHC ($1.50)! She needs to increase her price of water to make up for this added cost. 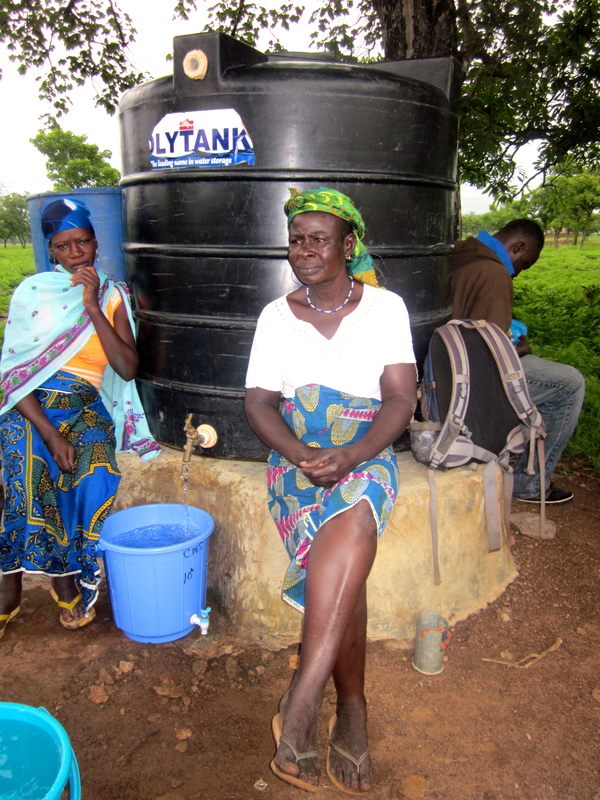 January 18, 2013 – Galinzegu – Amina’s polytank has been leaking, so the water she treated had dripped out. She lost 3 Aquatabs worth of water. 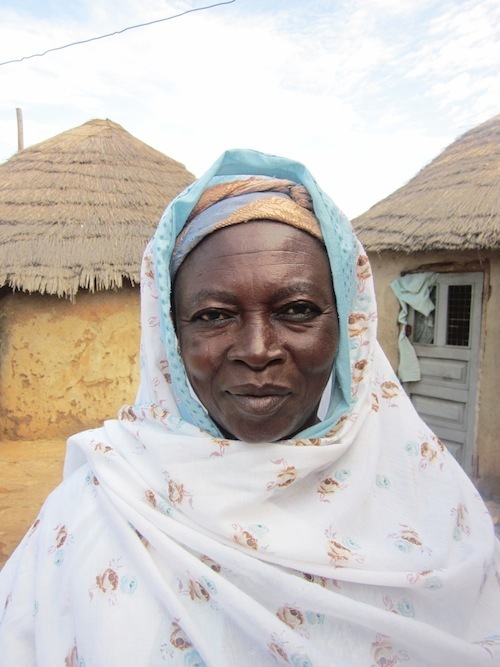 Two weeks later in February 2013, Amina ran out of alum and had not planned to buy more, and then had to travel for a funeral before she could treat water. The center was empty during this time. One year later, these communities have all made progress. CWS staff members would even say Jerigu, Gbung and Galinzegu are currently three of the highest performing water businesses. 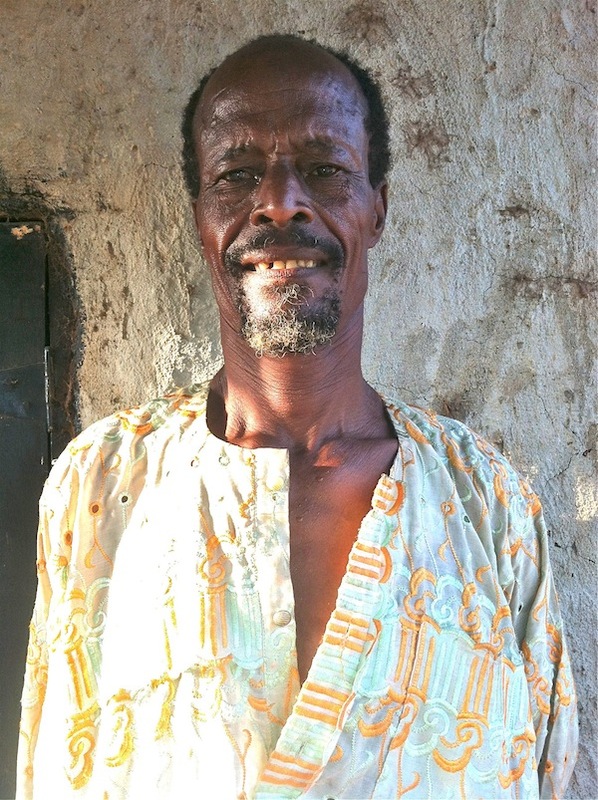 In Jerigu, Peter recently reported visiting the water business early one morning and monitored sales for 16 households that came out to buy water! 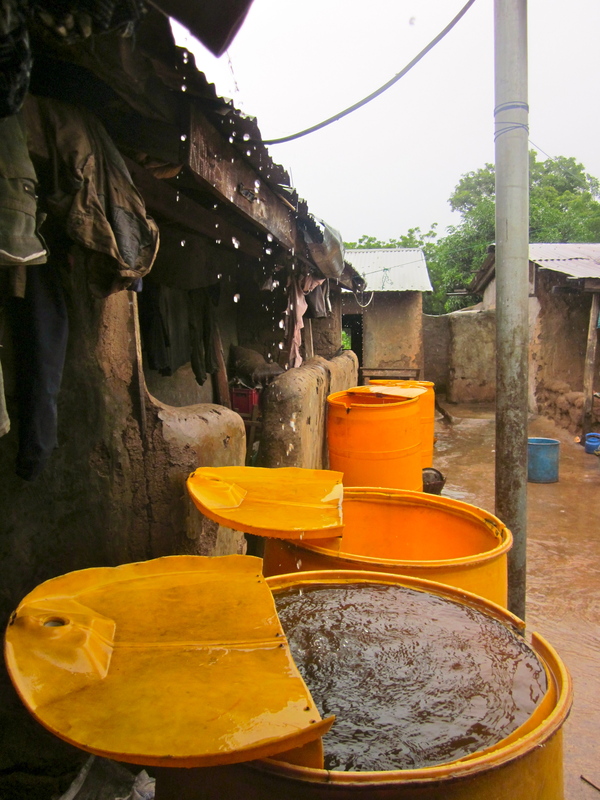 Household visit results from January 2014 were: 10 out of 12 households visited had clean water in their safe storage containers, which is 83% and well above CWS household visit average! Gbung also showed improvements since last year. 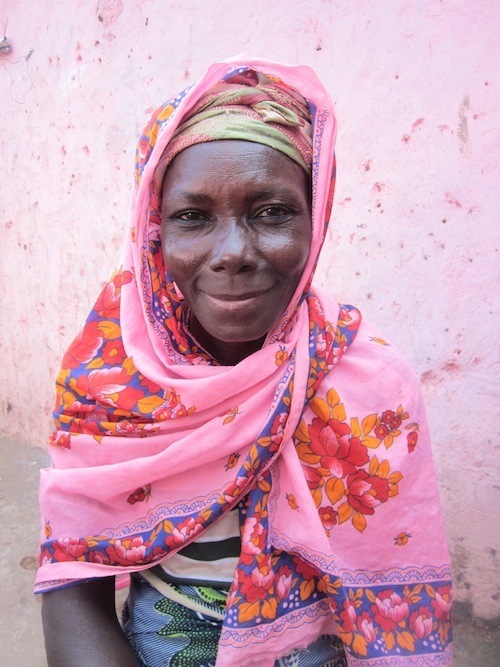 On February 3, 2014, Amina and Fati said that sales are going well, people come to buy water whenever they run out. They have kept their center at the market and community members pay 20 pesewas ($.10) per 20 L of water. 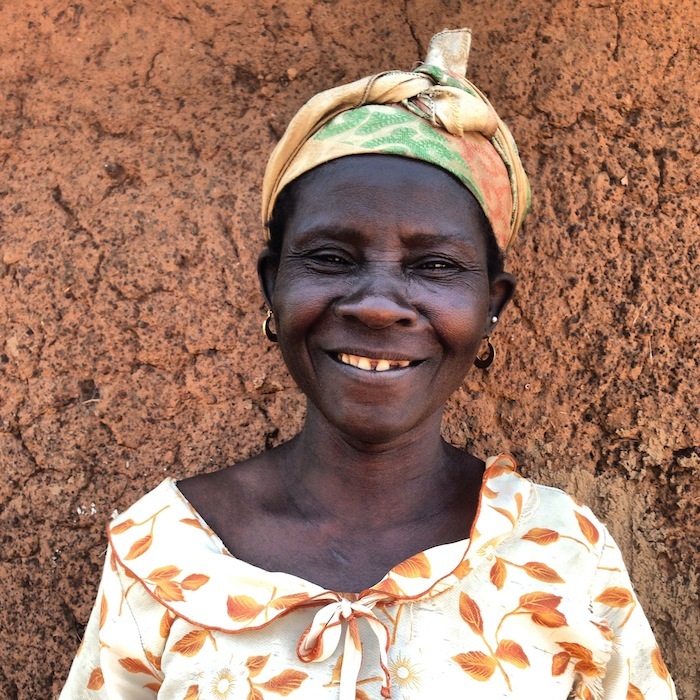 In Galinzegu, Amina has added Massamata to her water business team. When one of them travels, the other will be there to treat water. Massamata told CWS staff in January 2014 that she is always treating and selling water. 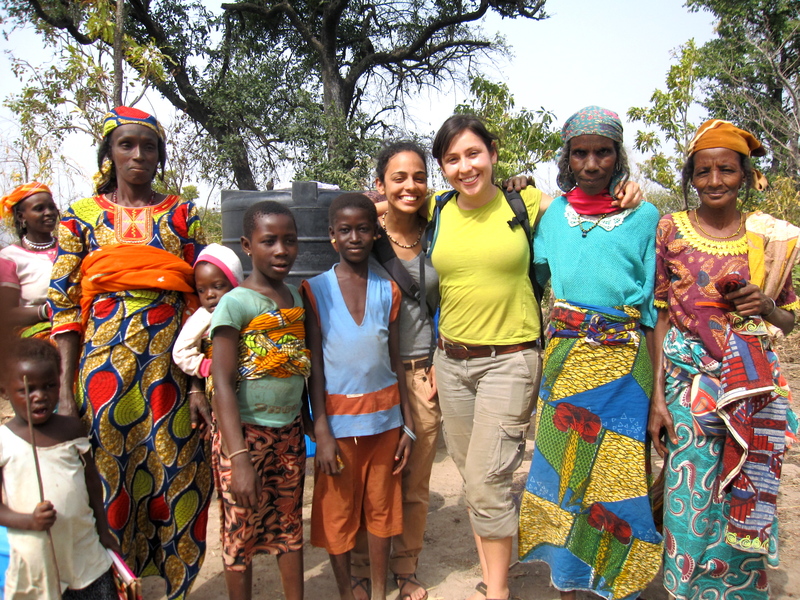 Households told field staffer Shak that they no longer have stomach pains or diarrhea because they drink the clean water! 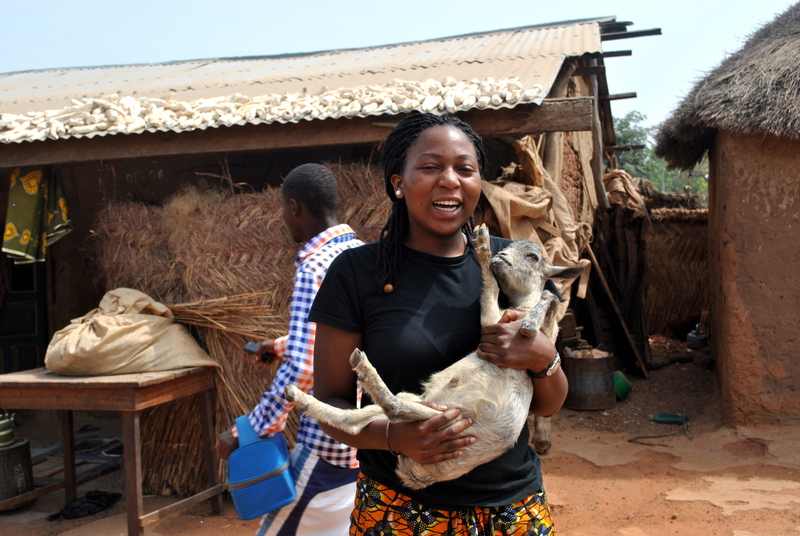 Monitoring sales with Amina in Galinzegu! Business is not always easy for the CWS entrepreneurs but monitoring helps. By frequently visiting the water businesses, the CWS field staff is able to consult the entrepreneurs and give them business strategy. 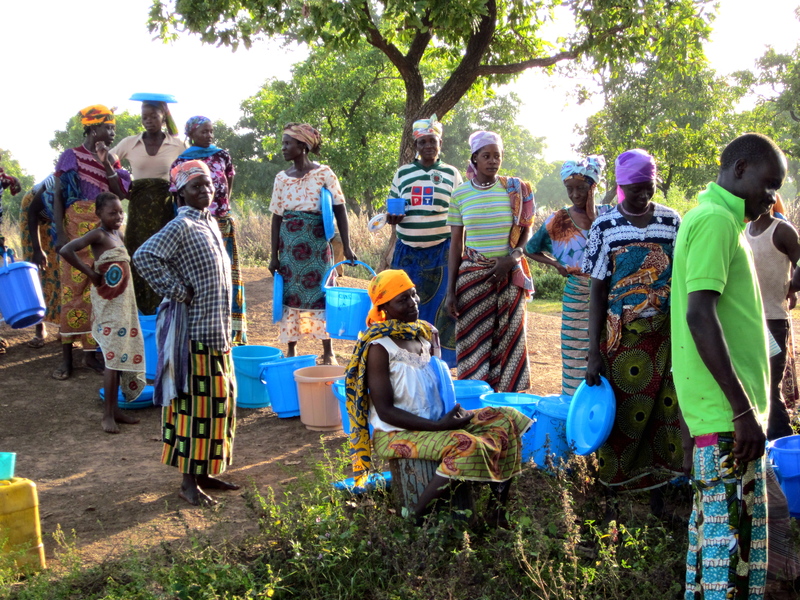 For example the strategies used in Jerigu, Gbung and Galinzegu: having a CWS field staffer come to monitor sales, discussing a price increase of water to make up for added treatment costs, or encouraging the community to have at least two women running the water treatment center at all times, are just a few of many ideas given to the entrepreneurs. In the future, CWS hopes the business owners will be able to make these decisions on their own by learning from experience. Through the use of monitoring and meeting with the entrepreneurs to work through issues in these “problem villages”, CWS is ensuring that the water businesses will be sustainable and independent in the long run. 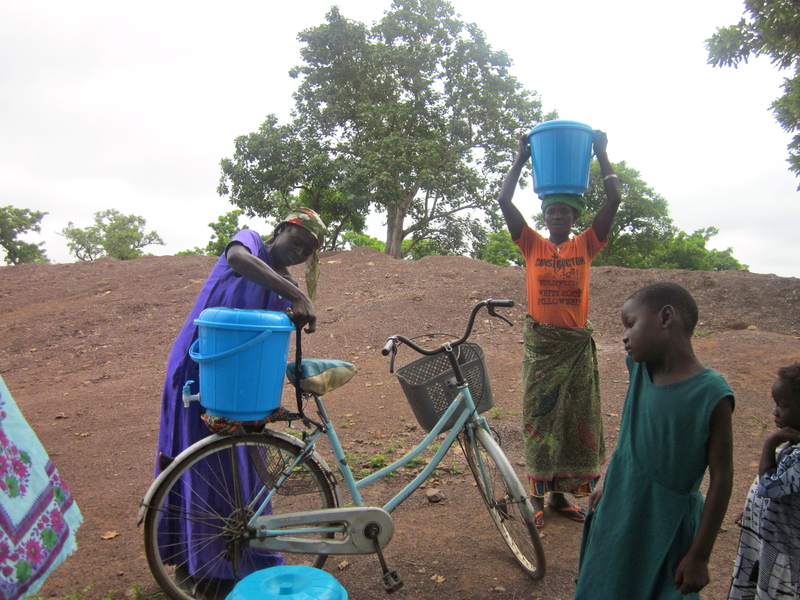 Happy customers on their way home from buying water from Amina and Massamata’s water business in Galinzegu! 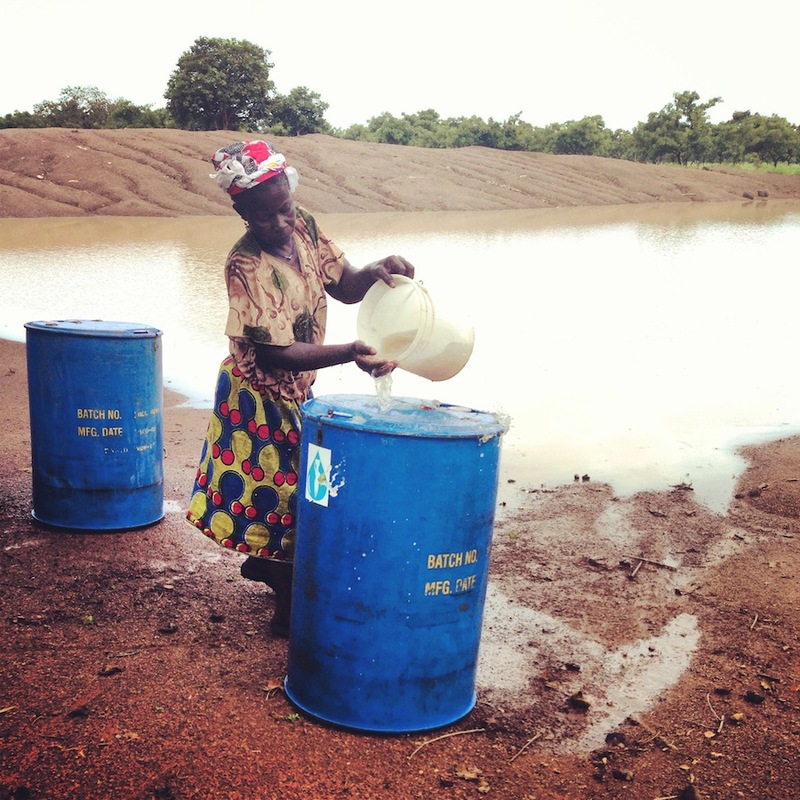 The rains “are finished” as Ghanaians would say, which means CWS water treatment centers are back in business! 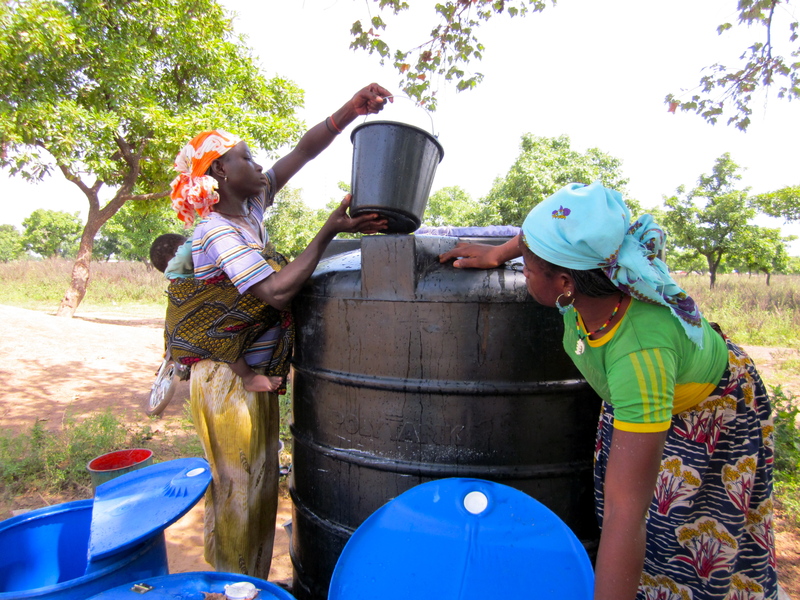 In the rainy season, which lasts from June- October in the Northern Region of Ghana, CWS communities collect rainwater. Rainwater is plentifully and freely available in these months, so community members opt for free drinking water instead of paying the $.05 to fill their 20 L containers at the water treatment center. 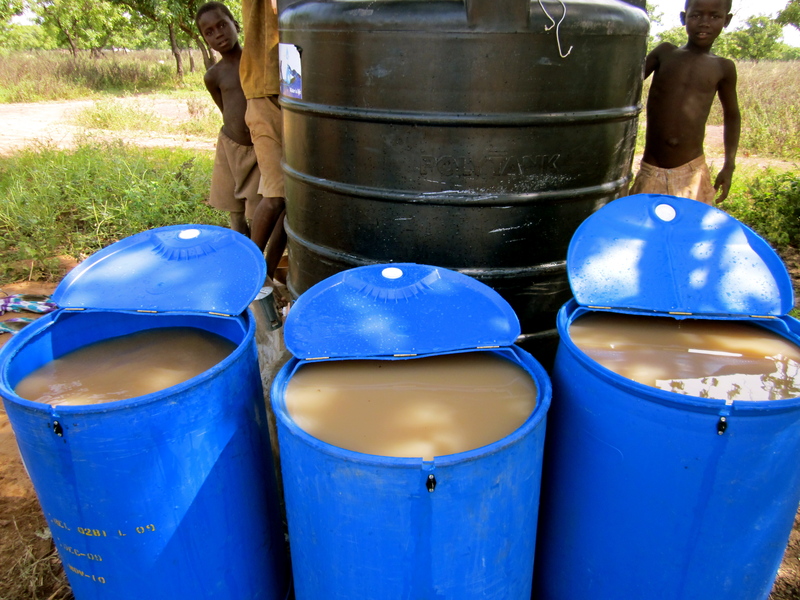 Rainwater collected in 200 L yellow drums in the village of Gidanturi. 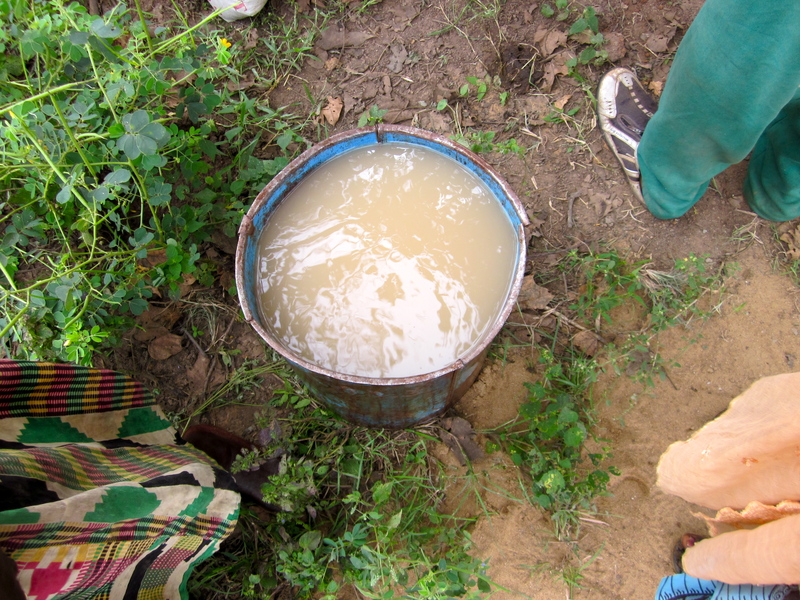 While this water is safe for using for household chores, it is easily contaminated. 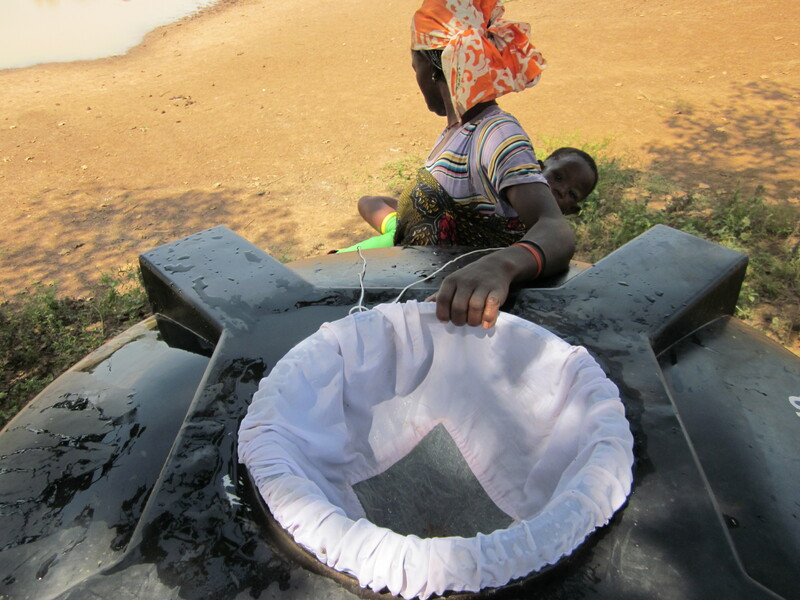 People need to open the lid and dip a scooping bucket in to fetch the water. Contamination alert! Now that the rains have stopped, the only available clean water source in CWS communities is for people to buy water from the centers. 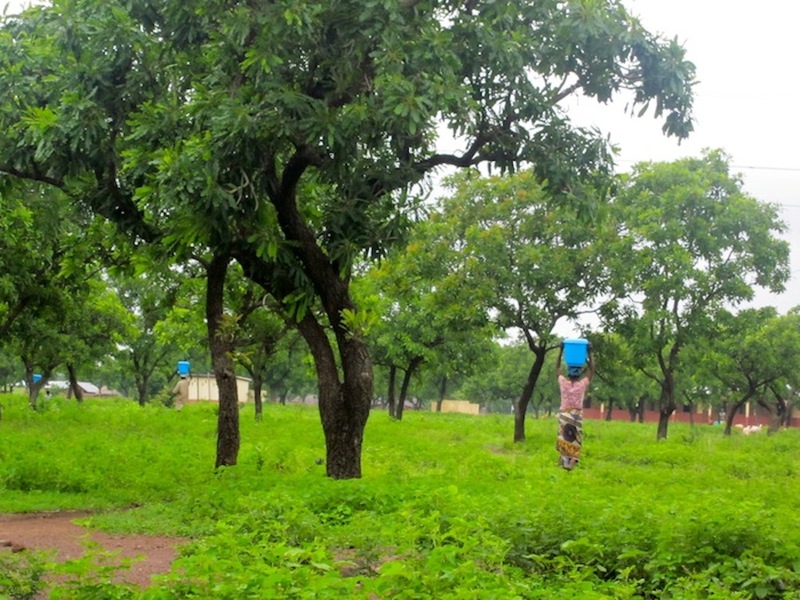 The only other water available for drinking would be stored rainwater in 200 L blue drums or clay pots (not safe for drinking), stored rainwater in cement rainwater catchment tanks (not safe for drinking), stored rainwater in hand dug wells (not safe for drinking) or dugout/stream water (definitely not safe for drinking). 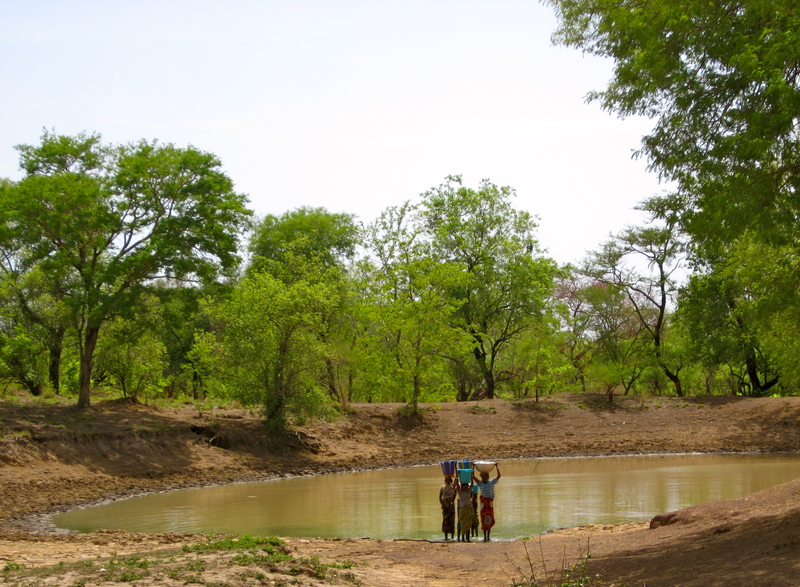 A “local well” in Kabache/Kasawuripe. This is the water the entrepreneurs have been treating in this community. It is not groundwater and is easily contaminated with human and animal waste… aka do not drink! Behavior change isn’t easy. And that’s what CWS is focusing on in transitioning from the rainy to the dry season. Changing the entrepreneurs’ behavior so they incorporate water treatment and selling water into their daily routines and changing the consumers’ behavior, so they get used to coming to buy water. CWS Field staffer Wahab making household surveying look easy. In most communities, this transition is seamless. 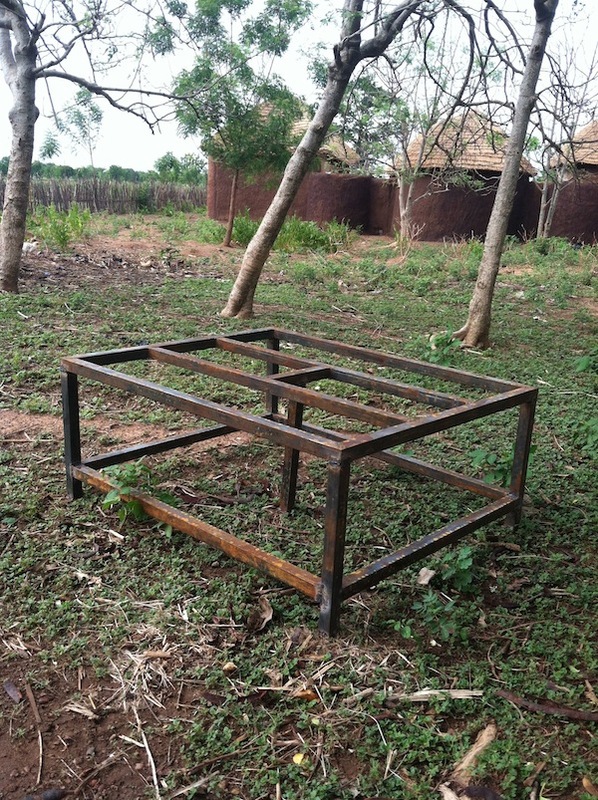 For example, in Kpanayili where the entrepreneurs now use a metal polytank stand to move the center from the various water sources throughout the year, their water business is operating with high sales! 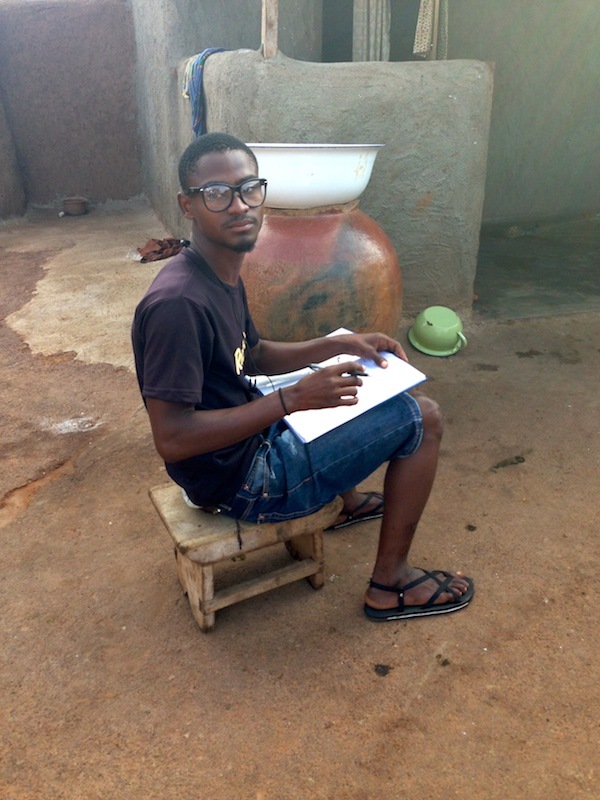 Field staffer Wahab is in charge of the monitoring and evaluation for Kpanayili. 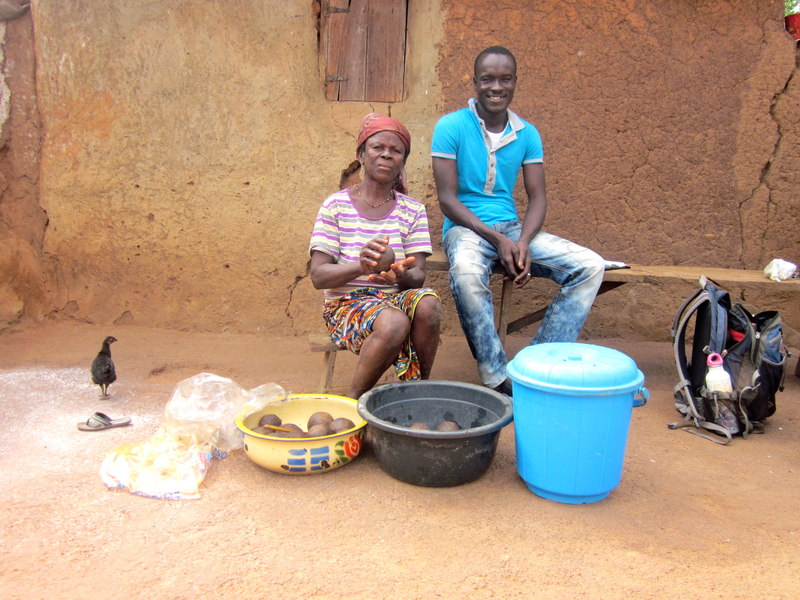 He reported on November 20, 2013, “It was such a happy day, seeing Kpanayili’s center up and running after the rains.” Last year, community members took their sweet time transitioning back to using the center and this year, they haven’t missed a beat. But in other communities, the transition has not been so seamless. 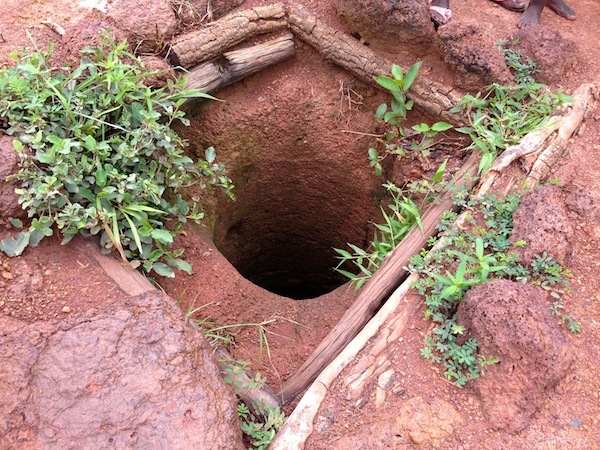 For example, in Nyamaliga, the community relies solely on rainwater throughout the rainy season because their dugout path gets muddy and slippery. I along with the other staff can vouch for this as we’ve all taken a tumble trying to get to the dugout. 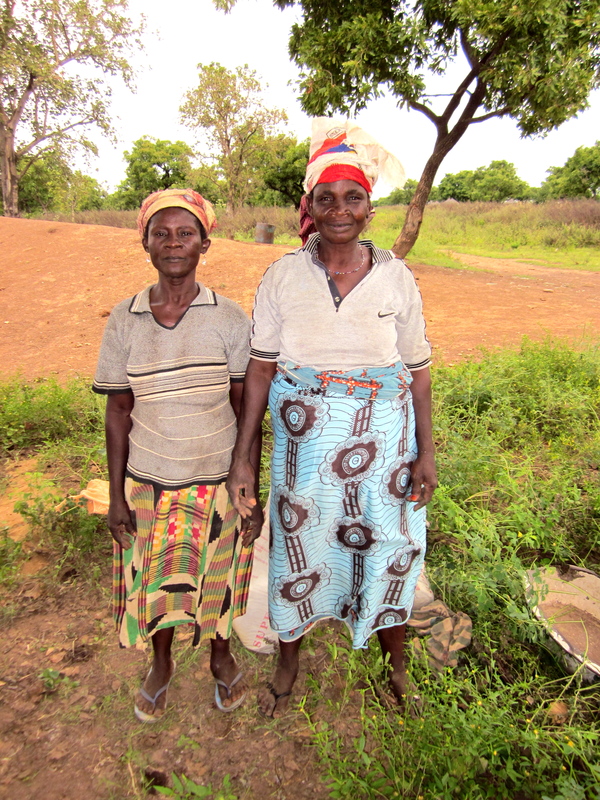 Sana and Sofou who run the center refuse to treat water until the community members help them weed the path to the water treatment center, which means a few weeks of people not having access to clean drinking water. This baffles the CWS field staff because if the path is dry then the entrepreneurs should be able to access the dugout! CWS Project Manager Peter reported this week that the path was clear so there should be no delay in water treatment… as for that one we’ll have to report back next week. 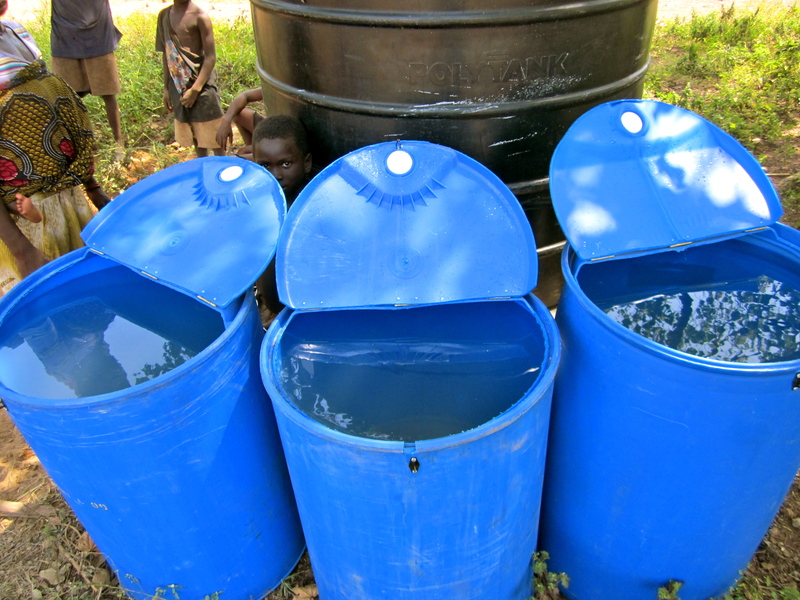 Rainwater catchment tank — CWS staff Amin and myself recently tested rainwater catchment tanks in Sakpalua, Djelo and Kpenchila. Almost every tank tested positive for total coliform and a few tested positive for e-coli. These tanks are hard to clean and the organizations that set them up do not return for testing or monitoring. We advise communities not to drink from them. 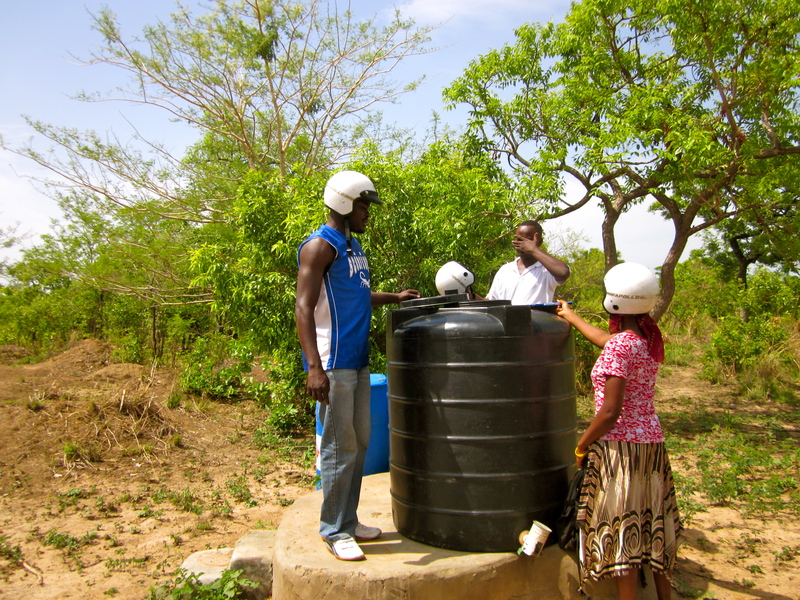 In Tohinaayili, the community decided to move their center to the town center during the rainy season to treat rainwater. This is Tohinaayili’s first transition from the rainy to the dry season, as CWS implemented here in the Winter of 2012-2013. While their polytank is not empty yet, the entrepreneurs have been lackadaisical to move it back to the dugout. The CWS field staff has seen this type of transition before and found that it takes a few seasons to get the hang of it. Finally, the path to Gbateni was flooded all rainy season. The CWS staff had not been there since May! 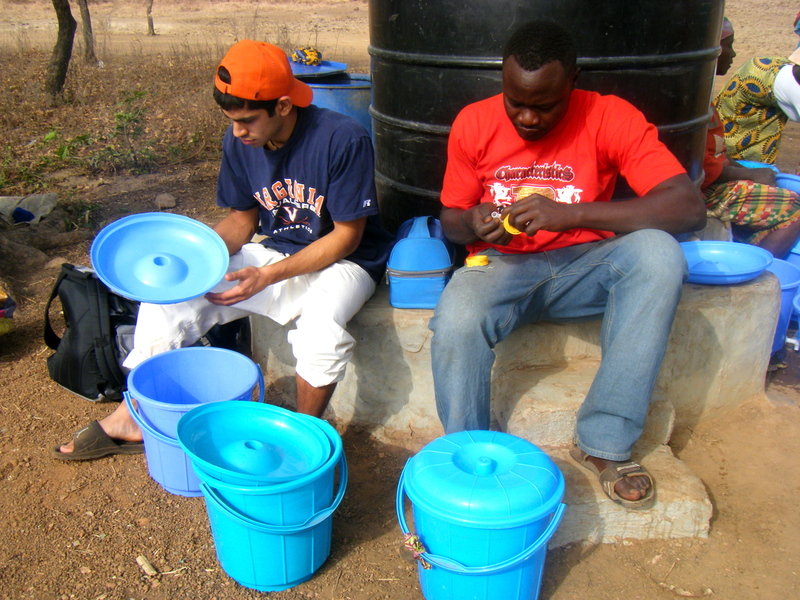 On November 20, 2013, CWS field staffers Amin and Peter were finally able to get there. They arrived at the center and it was empty, community members did not have clean water in their storage containers. The entrepreneurs were also not home so they could not figure out what was wrong. The staff will have to get back ASAP. Buhijaa and Chanaayili, villages that are also inaccessible to CWS staff during the rainy season, were up and running the entire season! Chanaayili even sent a message to Gidanturi mid rainy season requesting that CWS staff send aquatabs (chlorine tablets) with someone who was able to make it across the flooded road. 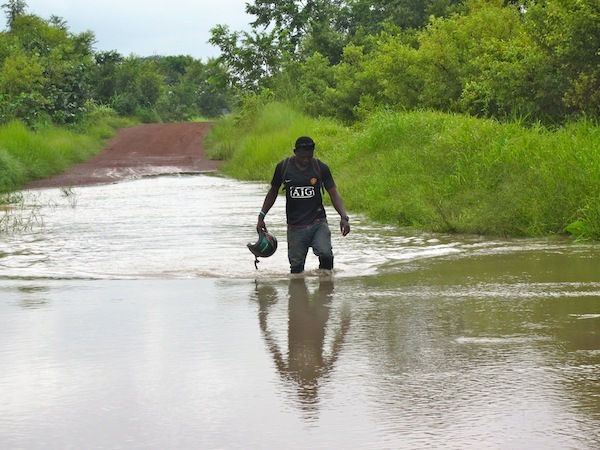 Amin trudges through the flooded path to Gbateni mid-rainy season. These seasonal transitions are a challenge for CWS every year. Each community adapts to the changing of seasons at a different pace. But the cool thing about CWS is that the field staff is with these entrepreneurs and communities throughout the process! The staff shows the entrepreneurs how to rally assemblymen, chiefs and queen mothers to get the communities back on track or even modifies the CWS technology (like the moveable metal polytank stands) so that these water businesses will be sustainable without staff help in the future! Today marks the 14th day of Ramadan. Ramadan is the ninth month of the Islamic calendar where Muslims fast from dawn until sunset, going without food or water for 30 days. The only people who do not fast are nursing or pregnant mothers, children under the age of 18, the elderly and the sick. While Ghana is a predominantly Christian country, the Northern Region has a large Muslim presence. The majority of CWS villages are also Muslim and therefore fast during the month of Ramadan. CWS field staff, Amin, Wahab, Shak, pose with the chief of Kadula and Azaratu, the lady who runs the water treatment center, after a long morning of household visits to promote rainwater harvesting in Kadula. Since most people are fasting, they are drinking less water during the day. This means that when people are drinking water before sunrise or after sunset, they have to make every drop count! In our household visits, CWS staff members have been emphasizing the importance of drinking clean water once the fast is broken. Even though most parents are fasting, it’s essential that the children still have access to the safe storage containers throughout the day. 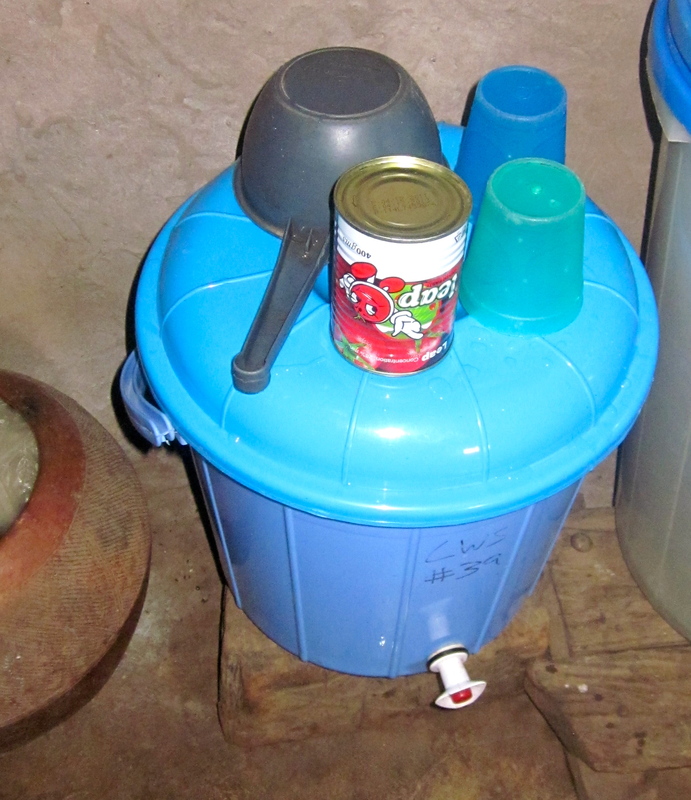 A Family in Yapalsi keeps 4 clean cups on their safe storage container, ready for drinking clean water! 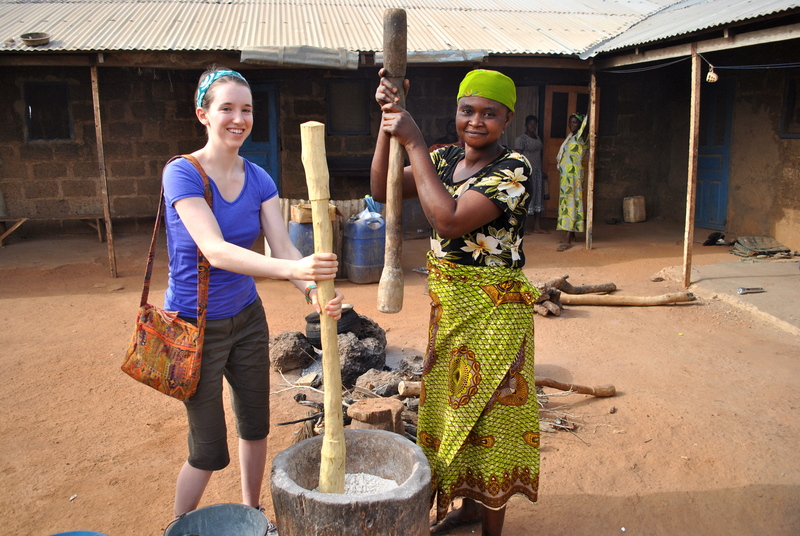 Amina pours water for a customer at the second opening day in the village of Galinzegu. 25 households came to fill their buckets! One household that Wahab and I spoke to in Kpalguni explained to us that they had just run out of water that morning because the family had gathered together to drink water to ensure strength for a day of fasting. 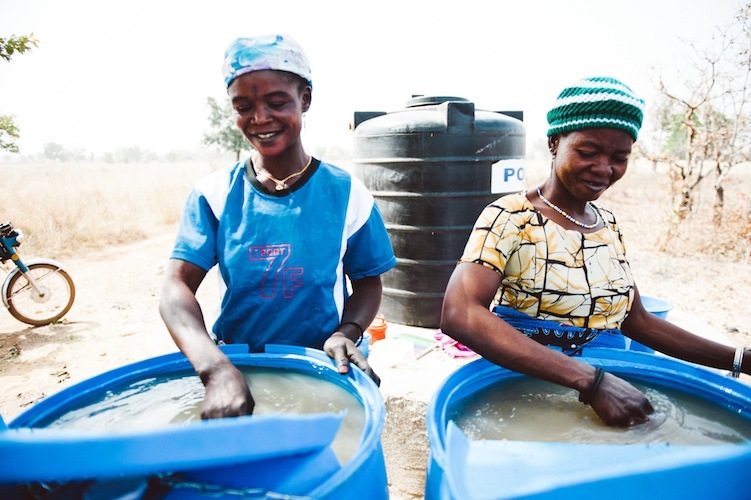 The community members of Jagberin have agreed to help Fulera and Aisha, the ladies that run the center, fill their blue drums with water from the dugout during Ramadan. 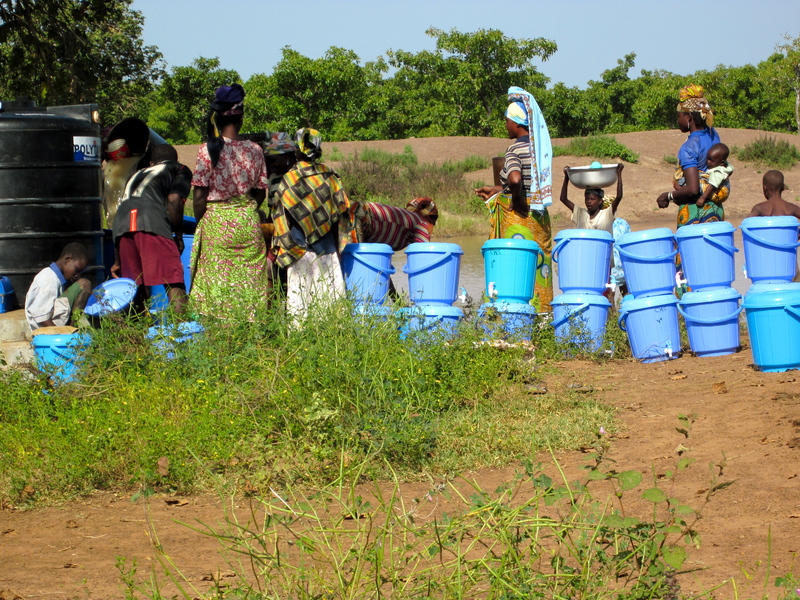 Since many of the women who run the CWS water businesses are fasting, they are weaker than usual during this month. In Yapalsi, Amin and I came across one household that has four clean cups sitting on top of their safe storage container, so that eager family members can break their fast with clean water at sunset. 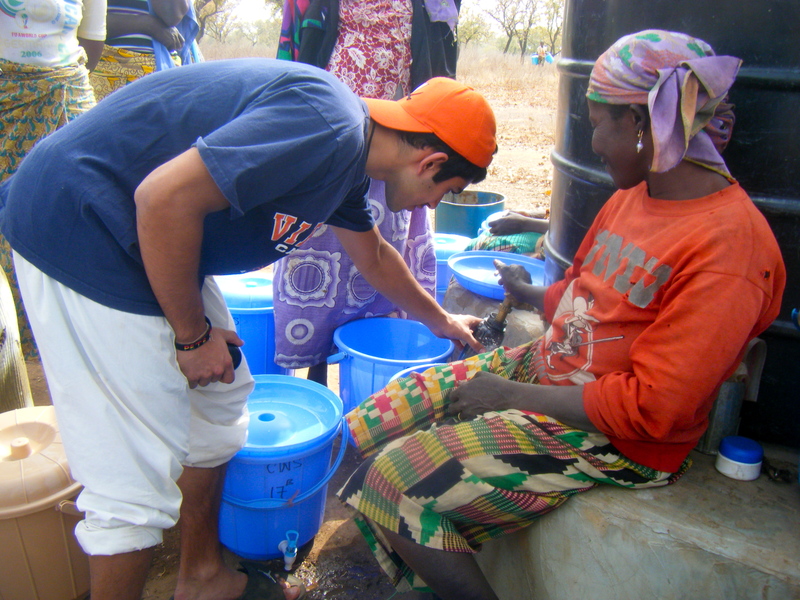 It seems that Ramadan is bringing people together to share clean water in many of the CWS villages this month! A woman secures her safe storage container to her bike after filling at the second opening day in Galinzegu! 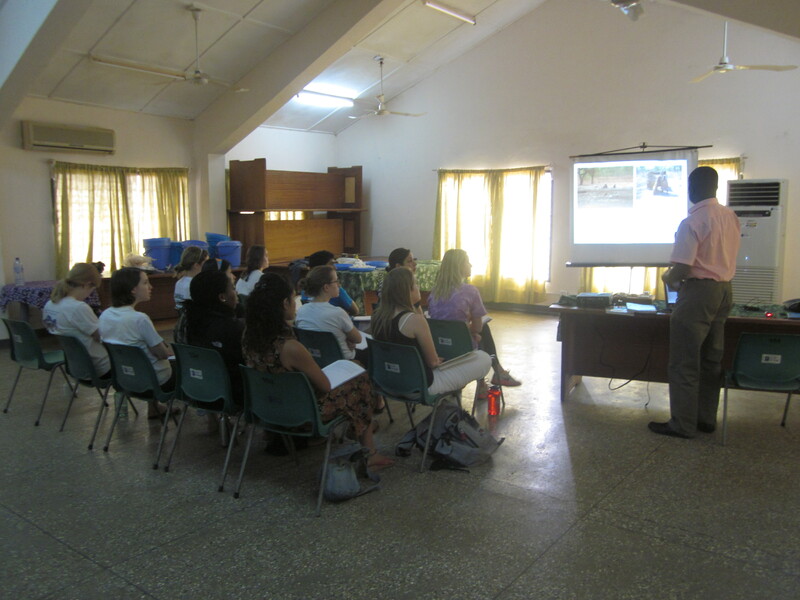 The Session 2 fellows started off their third day in Tamale with a great presentation by Foster Soley from unicef, who spoke about the work his organization is doing both here in Ghana and around the world. 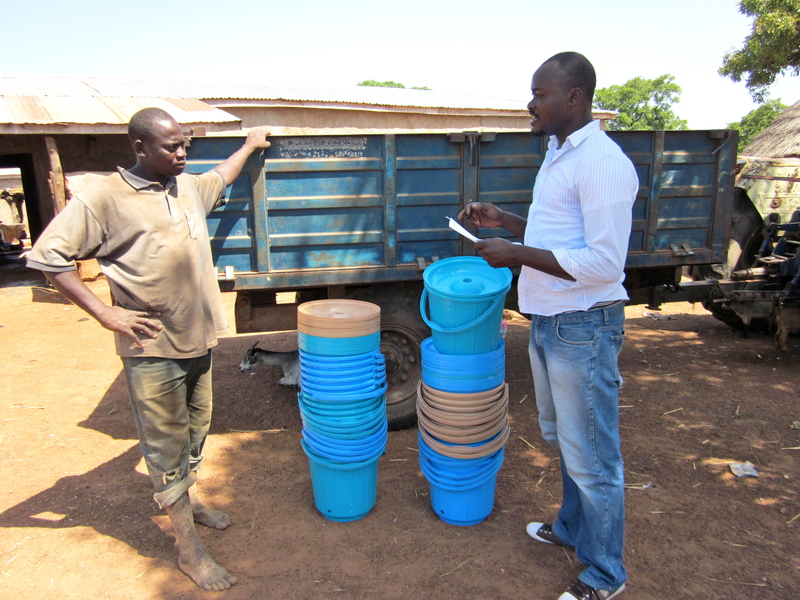 Foster is a WASH (Water, Sanitation and Hygiene) officer at unicef, who we have been working with in our unicef-cws partner villages in Central Gonja. His presentation was interesting and relevant, and the fellows asked some great questions! After lunch, the teams headed out on their first trip to the field to visits some CWS sites! 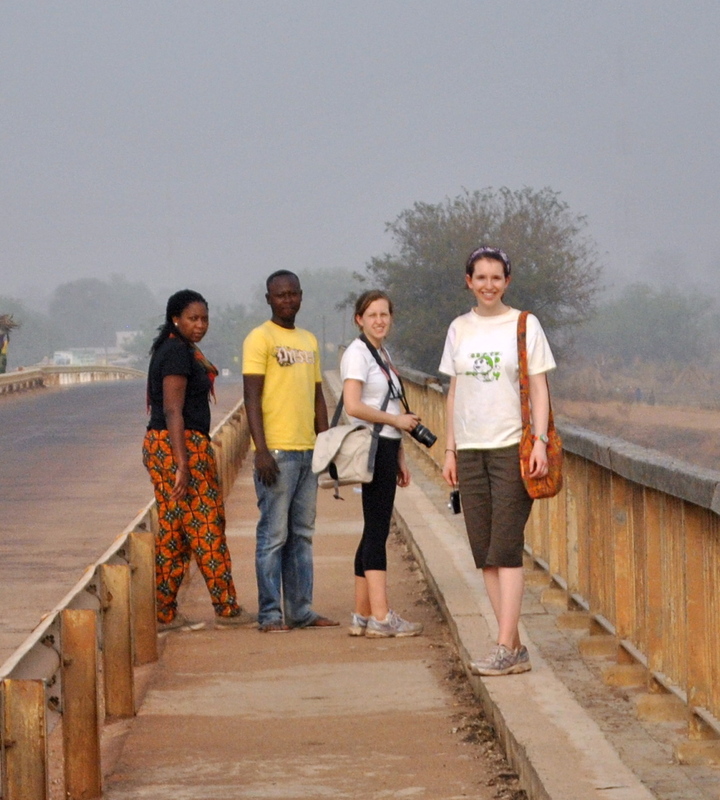 Team 5 went to went to Zanzugu and Gilanzegu; Team 6 checked out Chani and Nymaliga, while Team 7 when to Yipela and Nyanguripe. The fellows had a great time seeing our water treatment centers in person for the first time, and (as the pictures below show) seemed to assimilate with the villagers quite well! 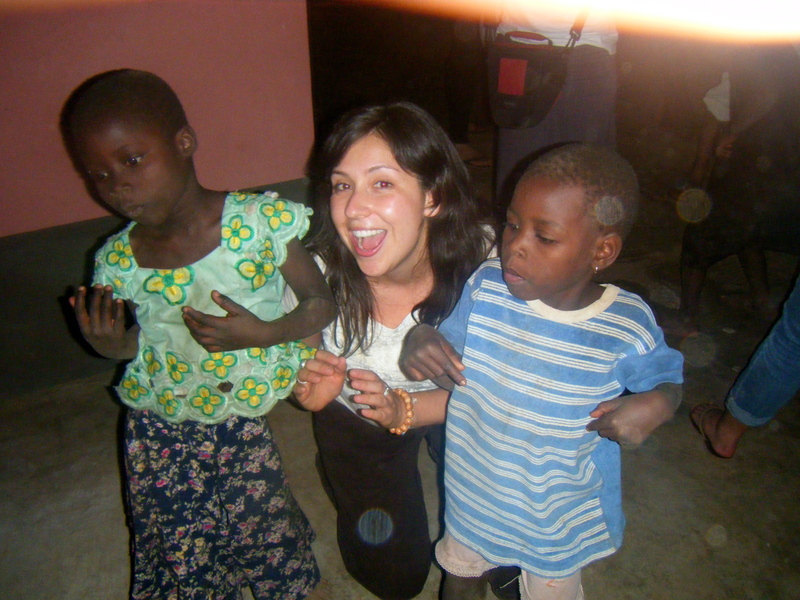 Most of the fellows enjoyed playing with the children in the village, Fabiola, however, had fun hanging out with a different kind of "kid"
The next day, the teams hit the the road bright and early so they could be at the villages in time to see people buying water. After an hour or so at the water treatment centers, they then performed random household visits where they could see how the water we provide is actually stored and used in the home. They took water samples at each house, which they brought back and tested in the lab to make sure the water wasn’t being re-contaminated. Sam and Barihama, our great taxi driver, after a long day in the field! 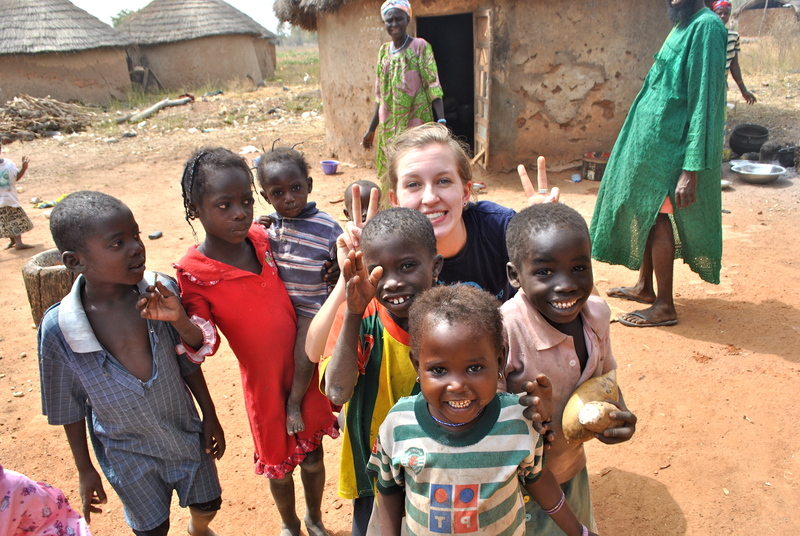 Eleanor and some new friends in Yipela! 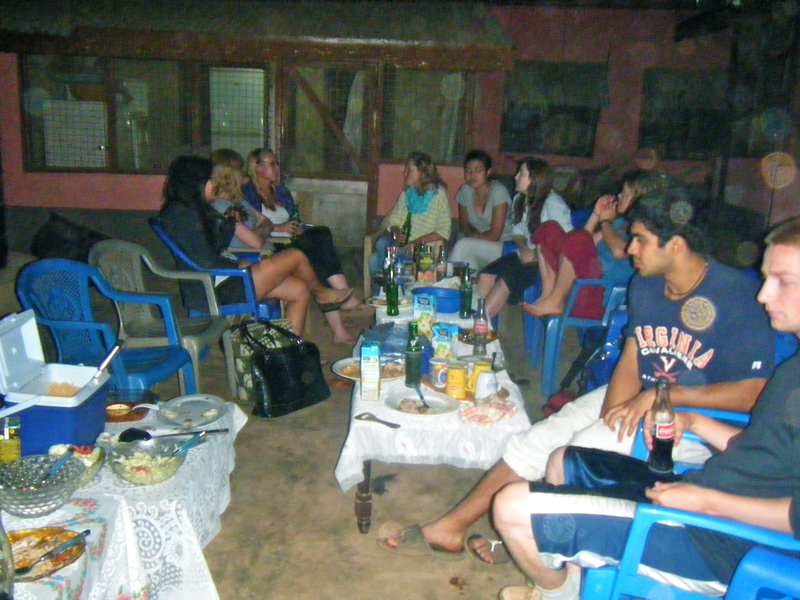 After a long day in the field, the fellows and I were definitely ready for a good meal. Annie’s family friend invited all 17 of us (12 Session 2 fellows, 4 Session 1 fellows and me!) over to their house for dinner and dancing. 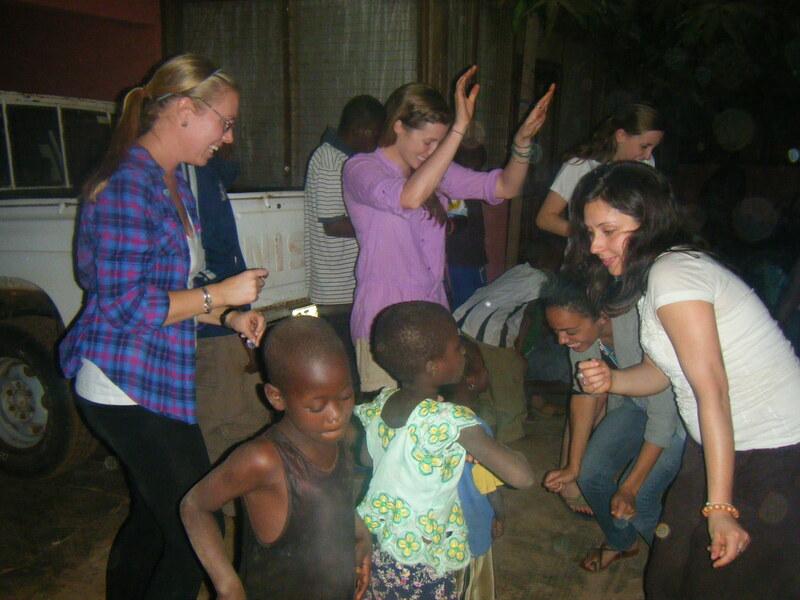 The meal was delicious (and of course the dancing was a blast!) It was an amazing experience that none of us will forget! The day after opening day in Kampong, we opened another water treatment business in the neighboring village of Gilanzegu. 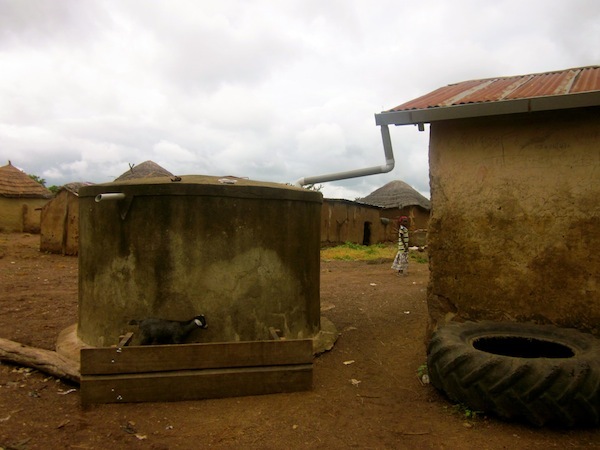 Like Kampong, we learned about Galinzegu’s need for safe drinking water from unicef who thought that the CWS model would work well in this community – so far they were right! 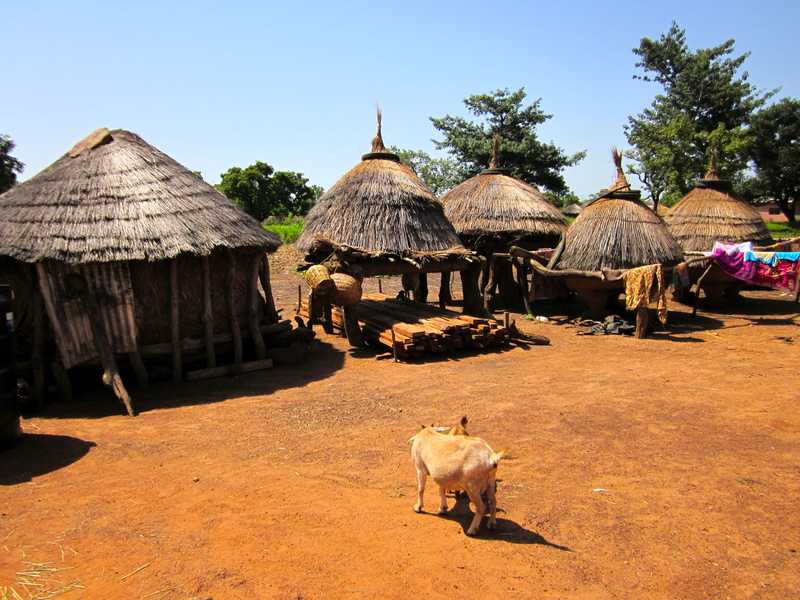 Galinzegu is a rural village of about 310 people, located in the Central Gonja District of Northern Region Ghana, 40 minutes outside of Tamale. 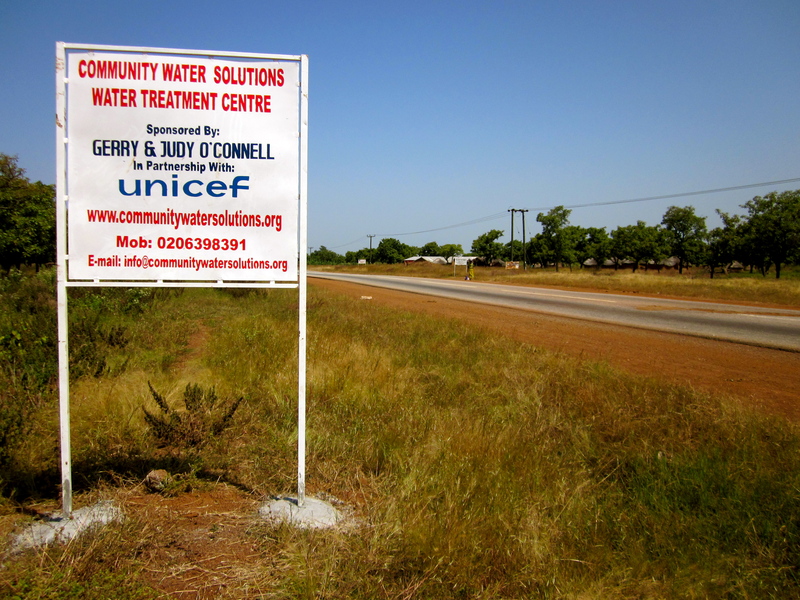 This water treatment business was sponsored by Gerry and Judy O’Connell. Gerry and Judy – thank you so much for your continued support! 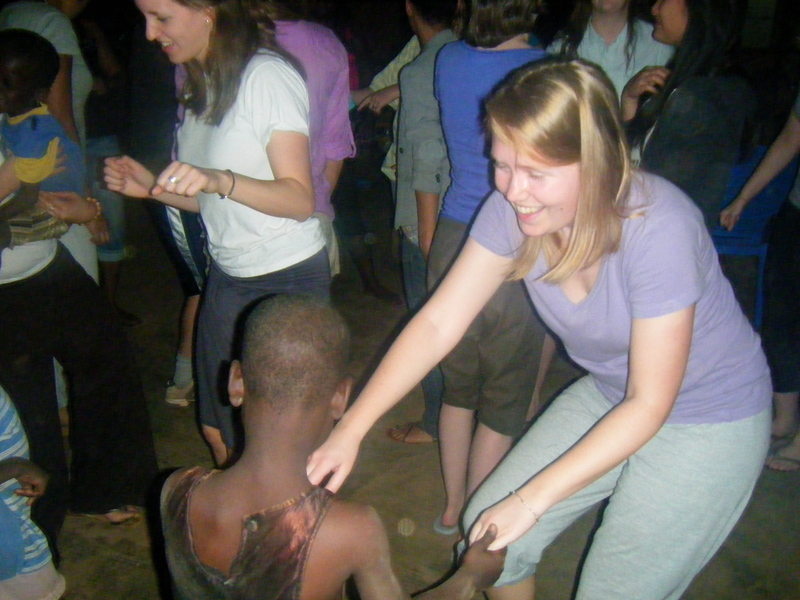 Here are some pictures from Galinzegu! 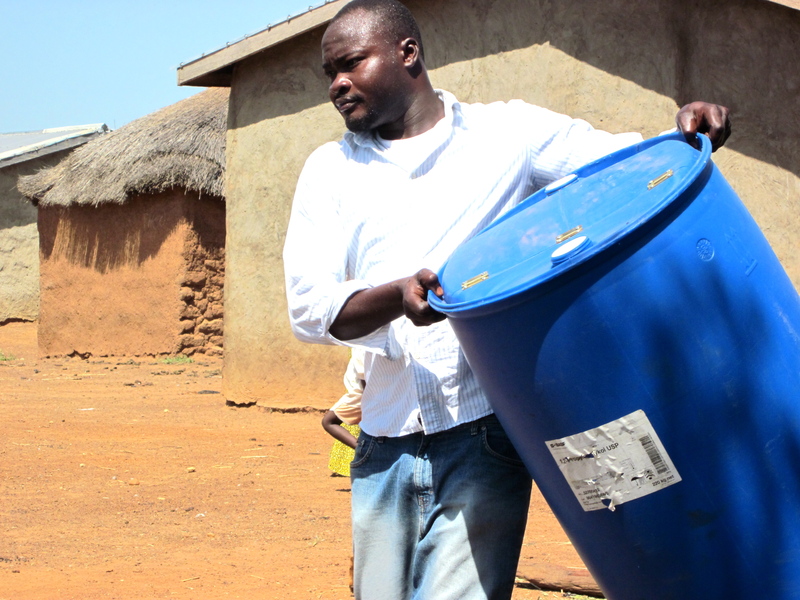 Shak, distributing safe storage containers in Gilanzegu. 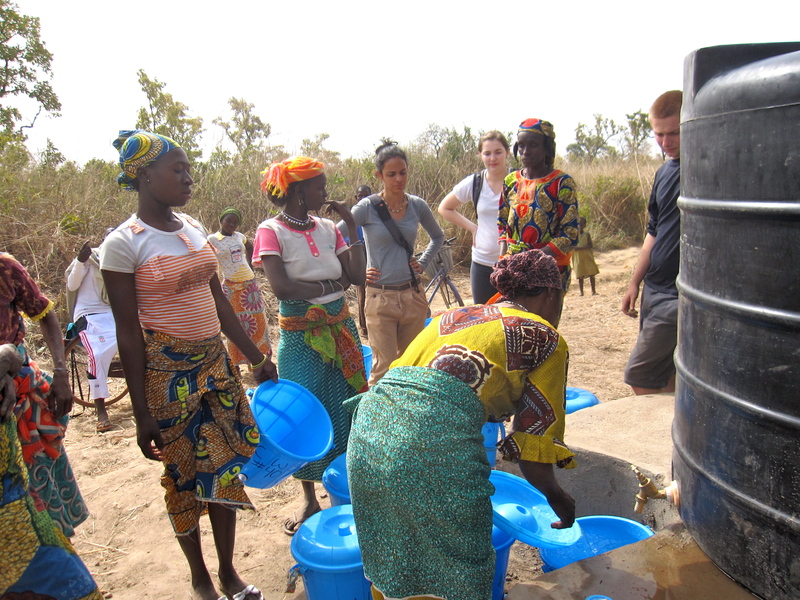 The CWS ladies in Gilanzegu scooping water from the 200-L drums into the polytank. Shak recording household numbers on opening day! The water business was packed on opening day! The busiest spot in the village! Thank you Gerry and Judy!! 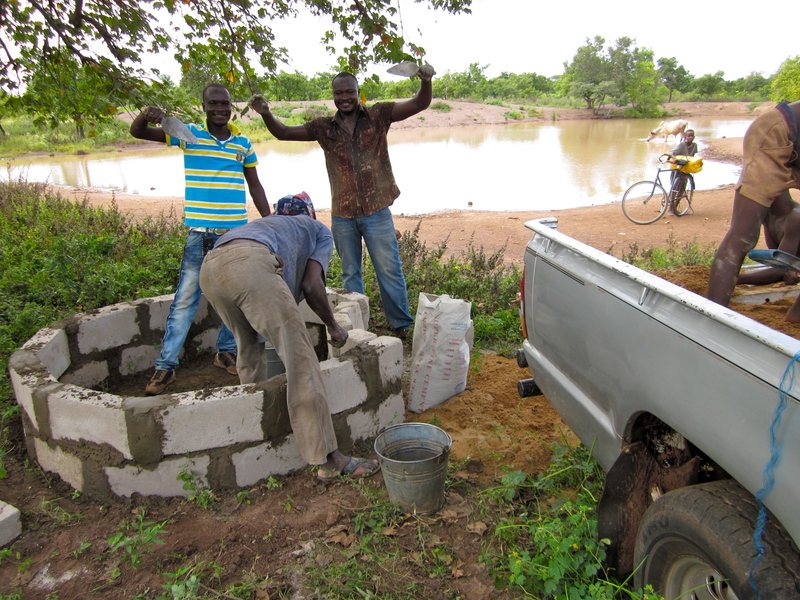 Community Water Solutions implemented our first water business in June 2008 in the village of Kasaligu in the Northern Region of Ghana. 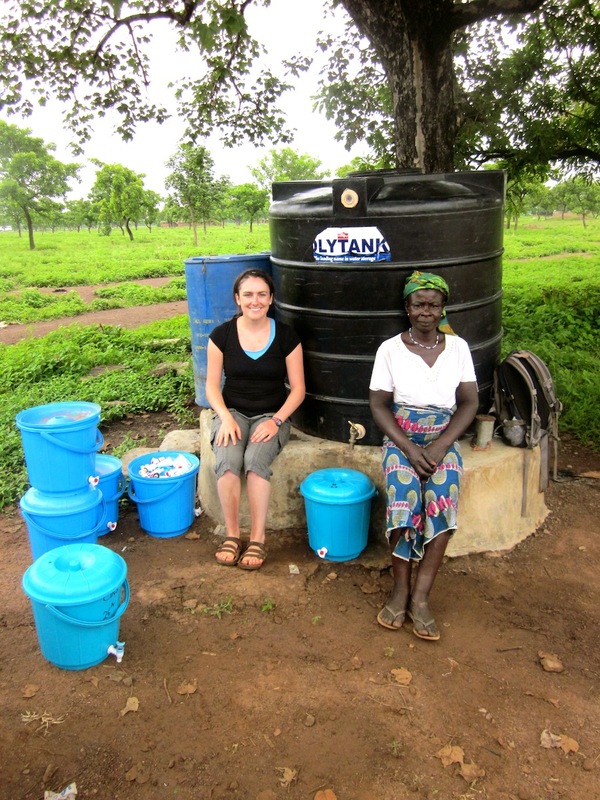 7 months later, in January of 2009, we opened our second water business in Nyamaliga. 9 months later, in October 2009 we opened our third water business Jargiu. 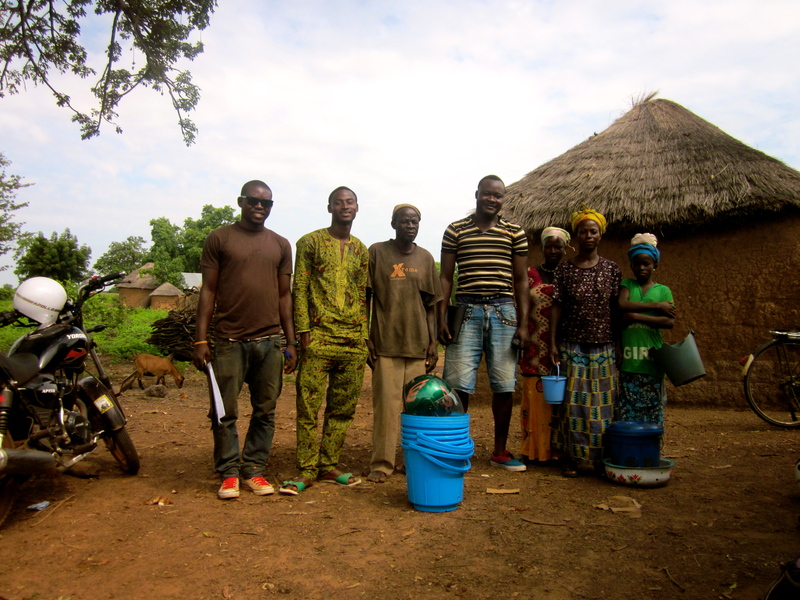 After a successful holiday season of fundraising and with the help of our 2010 Summer Fellows, we opened four new water businesses during the first half of 2010, in Cheko, Gbong, Gidanturu, and Wambong. 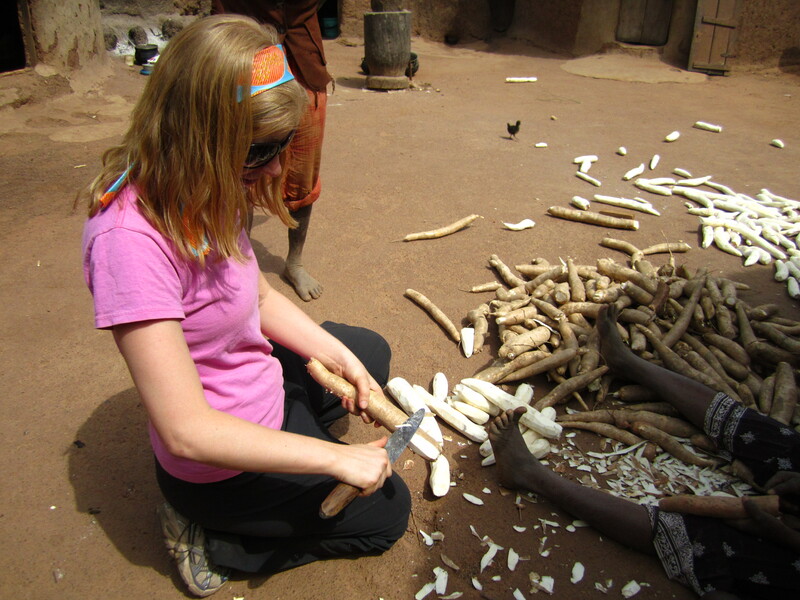 We’ve spent the past two and half years slowly expanding, learning new things from each village, and slightly modifying our approach based on these lessons. We’ve learned a lot about fundraising, about building a non-profit, and about harnessing the enthusiasm and knowledge of willing volunteers. But, we now have the experience and resources to finally start scaling-up, and we’re planning to do it quickly! 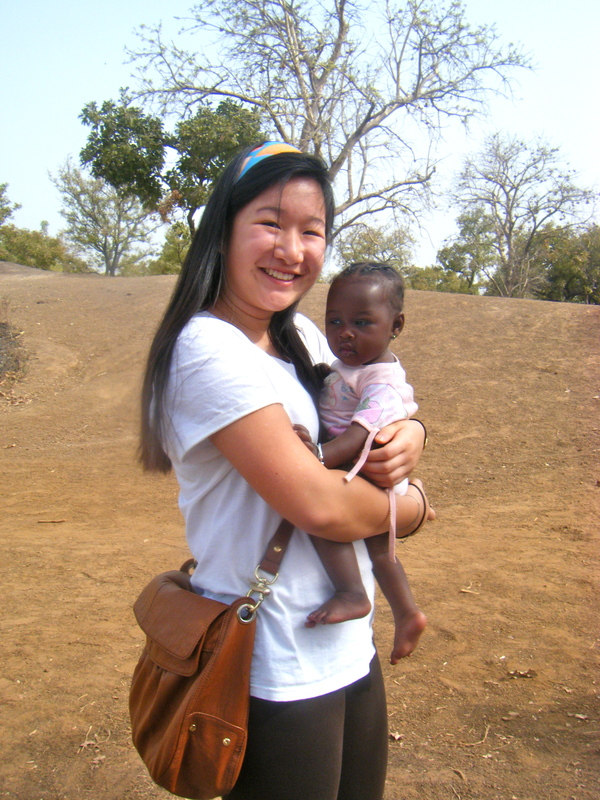 There are about 900,000 people in the Northern Region of Ghana (and 884 million around the world!) without clean drinking water, and we’re really excited to start making a significant dent in that number! This November (as in right now!) 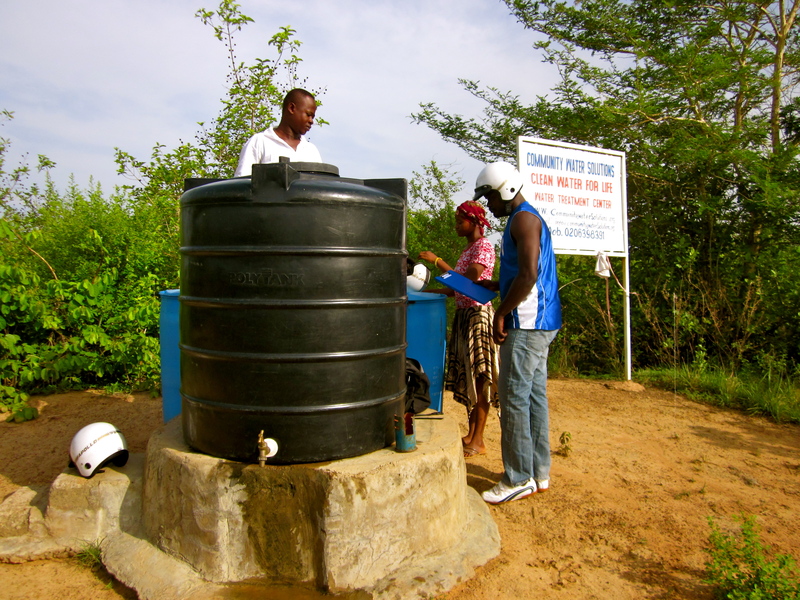 CWS is implementing three new water businesses in the villages of Kampong, Galizengu, and Nyanguripe. By the end of December, we will be in two more. 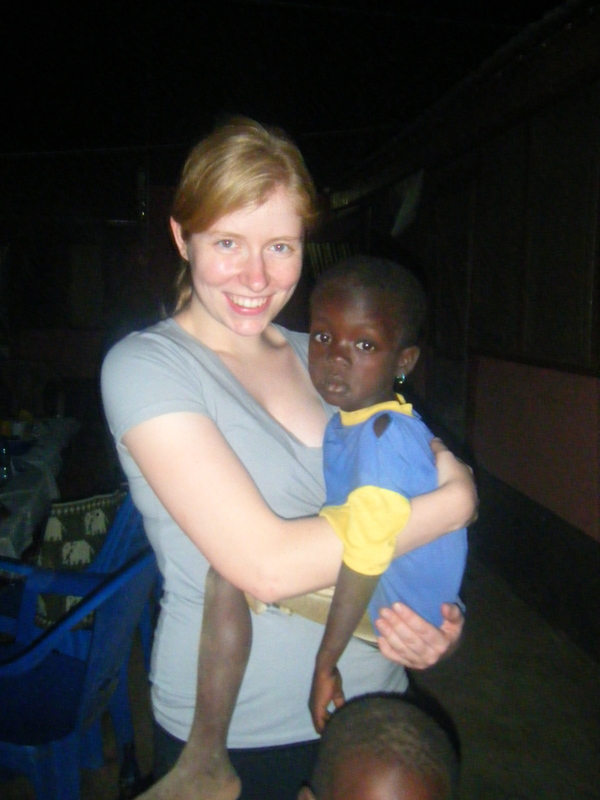 By February 2011, with the help of the 2011 Winter Fellows we will be in a total of 19 villages in Northern Region Ghana. In just three months, we are going to more than double to the amount of people we serve and we have no plans of slowing down! to everyone who has supported CWS over the past two years. We would especially like to thank the Public Service Center and the Legatum Center at MIT for funding our first two pilot villages, as well as our awesome village sponsors: Volunteer Shredding (Jarigu), iContact (Gbong), an anonymous friend (Cheko), Colleen and Jeff Clopeck (Gidanturu), The Medfield FitGirls (Kampong), Gerry and Judy O’Connell (Gilanzegu), The Nolans (Nyanguripe), The Reids (one of the villages for December), and the CWS Facebook Causes Team (the second village in December). Finally, I would also like to thank Jay Roche whose generous donation helped us to purchase the CWS Truck (without which, this scale-up would not be possible.) THANK YOU ALL! 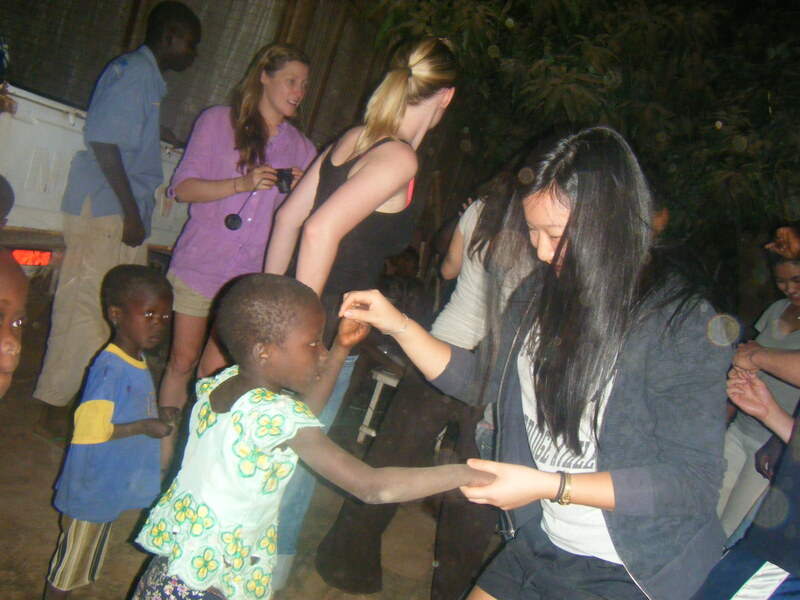 Here are some pictures from our work over the past week in Kampong and Galinzegu. I have taken A LOT more, but the internet has been slow and sporadic, so these will have to do for now! I’ll keep trying to put more up on this blog as soon as possible! 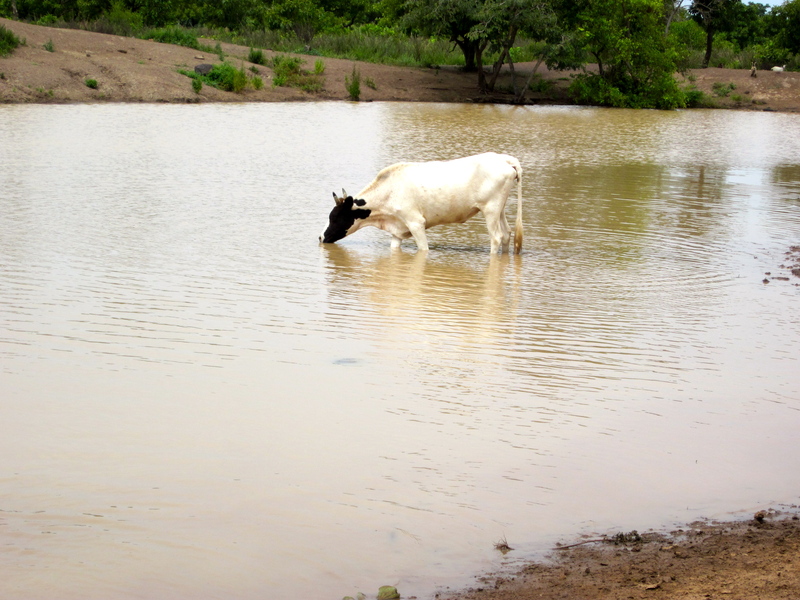 A cow, standing in and drinking water from the Kampong dugout - the only source of drinking water in this village. 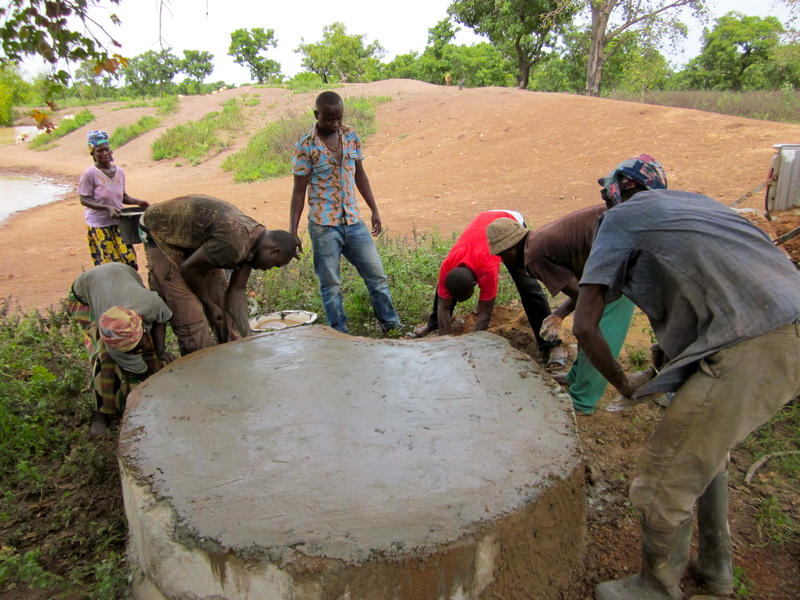 Finishing up the polytank stand in Gilanzegu. 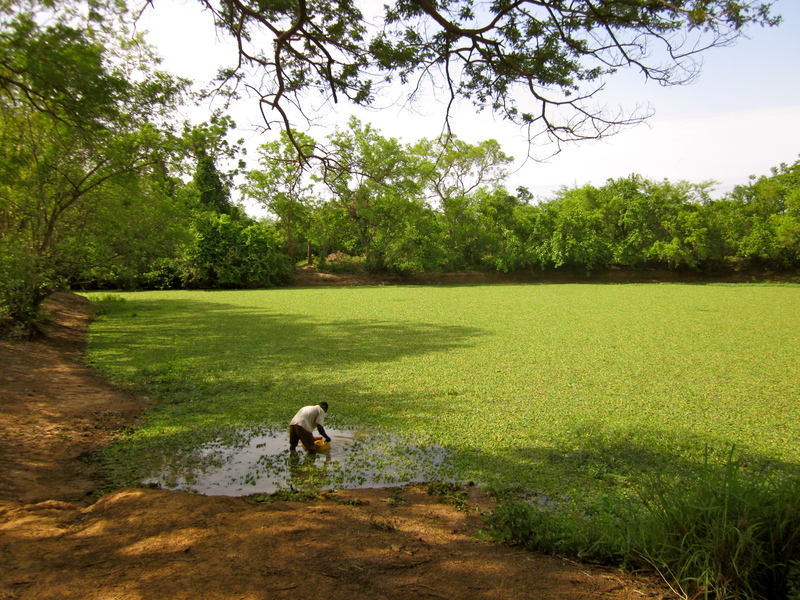 A garaou of dugout water in Gilanzegu. This is the water that people in the village are currently drinking.